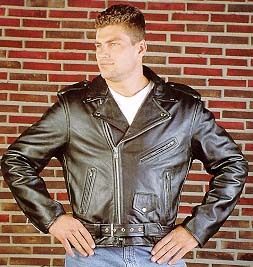 Made of selected leather hides with nickel hardware, the basic motorcycle jacket features three zippered front pockets (twin hand pockets and a slash chest pocket), adjustable zippered sleeves, and a flap watch pocket. The front 1/2 belt is sewn into the side seams. Inside pocket to safeguard personal belongings. Collar snaps hold your collar secure when riding. Epaulettes can hold your gloves or other accessories when needed. Bi-swing back gussets allow easy forward reach, neatly retracting while arms are in a downward position. Clean and condition these leathers with leather balm. You may use snow seal or mink oil to weatherproof . Matching cream or wax polish can be used to enhance the color. Sizing on these coats tends to be small. Order a size larger than your chest measurement for a snug fit and two sizes larger for a more relaxed fit. Style 010 is made of select Buffalo hides. Buffalo is a variable grain leather that will usually have some natural scars and blemishes due to the wild nature of the beast. Panels of the coat may have slight variations in appearance...more of a distressed or retro look. Buffalo breaks in soft and fast. Style No. 013 is the same quality and description as style 010 with the added attraction of 2" longer body and sleeves. This allows the wearer to reach as needed comfortably, for those who are blessed with more reach.